It is half an hour past sunset, calm, with the sky the hue of deep blue that is just starting to edge over to darkness. Orange tinges the horizon to the northwest and, overhead, a dozen gleaming stars have already made their presence felt. Alpha and Beta Centauri chasing the cross perpetually around the sky. Canopus rides high above a quickly setting Sirius. Far to the north, nearly done with their short jaunt through the sky are Castor and Pollux. As the sky darkens, the ceiling hook of Leo follows not far behind. 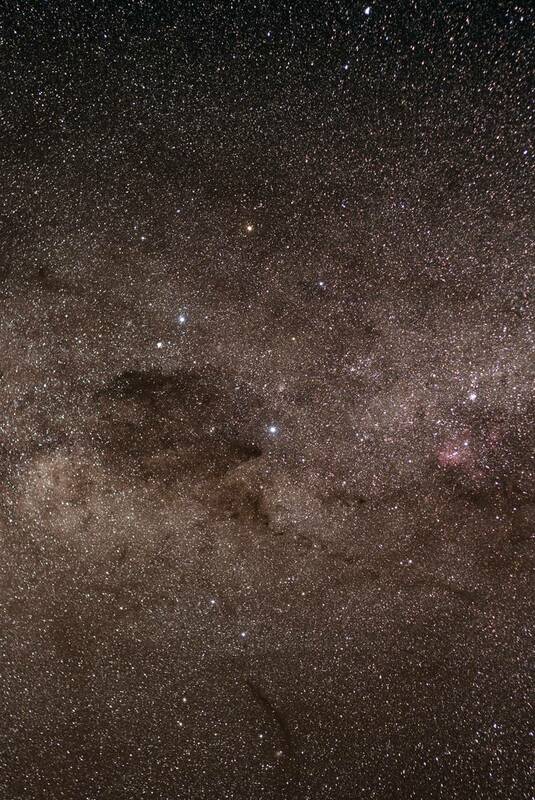 In the east, Scorpius lies on its back, already well above the horizon. Spica pairs with Jupiter near the zenith while, lagging behind and far below, Arcturus follows. In the far north, the Big Dipper makes a brief appearance. I am in Chile’s Atacama Desert, a dream destination for northern astronomers. I have had the good fortune to spend almost six months in South America in 2017 and my own observations have mirrored von Humboldt’s. As eager and happy as I was to witness a new sky, it cannot help but make me a little homesick. The southern hemisphere beckons to a northerner with its many legendary deep space objects. Adding to this, in 2017 both Jupiter and Saturn came to opposition well south of the celestial equator affording me a much better view than I would have had at home. 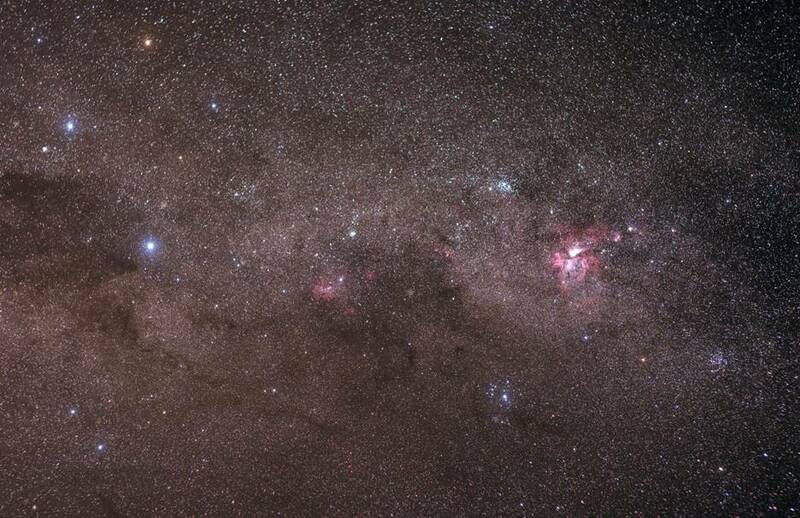 Crux and Eta Carina. Stack of 30 120-second exposures with a Canon 50mm lens at f/2.8. 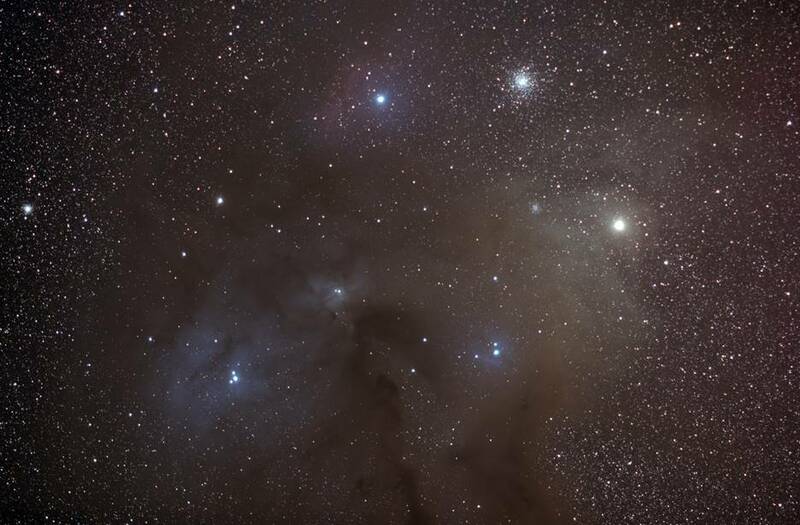 Traveling to the southern hemisphere is a topic that pops up frequently on Cloudynights and other amateur astronomy discussion groups where northern observers and imagers congregate. 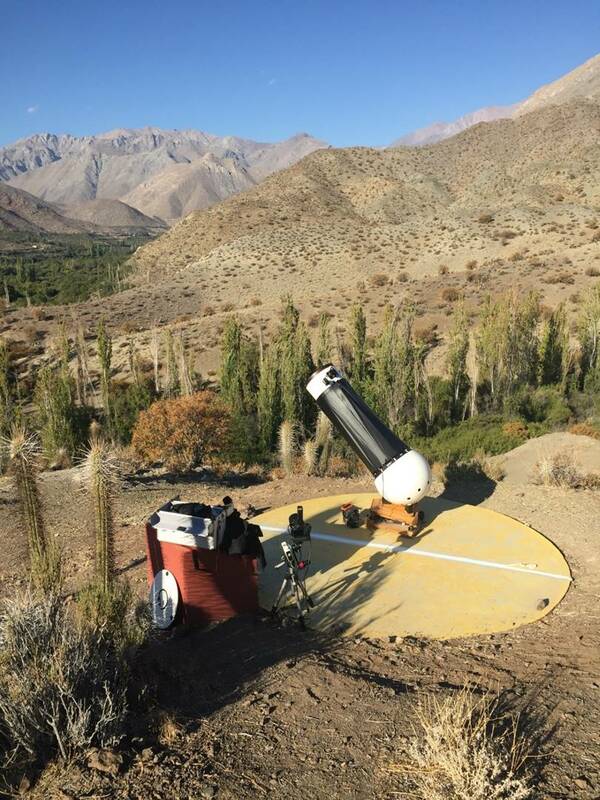 I’ve written this piece to try to share some of what I learned about doing amateur astronomy in Chile and Argentina. Obviously, even in six months it is impossible to do everything or go everywhere so this isn’t a comprehensive guide. Still, I hope it’s helpful and that it inspires a few people who have been wavering in their decision to head south. Chile and Argentina are dominated by their capital cities in a way that most nations, especially the United States, are not. Something like 25% of Argentines live in the Buenos Aires metro area and close to 40% of Chileans live in metro Santiago. This means two things for the astronomer interested in dark skies. It means that the countryside is quite rural, which is good. It also means that mass transportation to dark skies is essentially non-existent. The other thing I saw in both Argentina and Chile is that essentially all properties are gated and fenced. This is also good for the astronomer as it appears that property owners in South America believe that a good fence and sturdy gate is better security than floodlights shining where no one is looking. But it makes ingress and egress from properties problematic. A little bit of Spanish will take you a long way. Relative to Europe, few people have much English outside tourist destinations in the respective capitals. I wouldn’t say that it is an absolute requirement but, if you’re planning such a trip, it might be a good idea to spend a couple of months playing with Duolingo Spanish. That won’t get you to the point of holding deep, philosophical conversations at the bar but it should get you a beer and an empanada. Hand gestures work, too. The only international flights to either Argentina or Chile from North America are to Buenos Aires or Santiago, respectively. Even if your ultimate destination is hours flying from these cities or back the way you came you’ll have to pass through these cities. The flight to Santiago from Dallas is roughly nine hours. The flight from Europe is, obviously, much longer. Overall travel time from North America, assuming one connection, will be in the 12 hour range while from Europe it will be closer to 24. A further connection in South America can easily add several more hours. 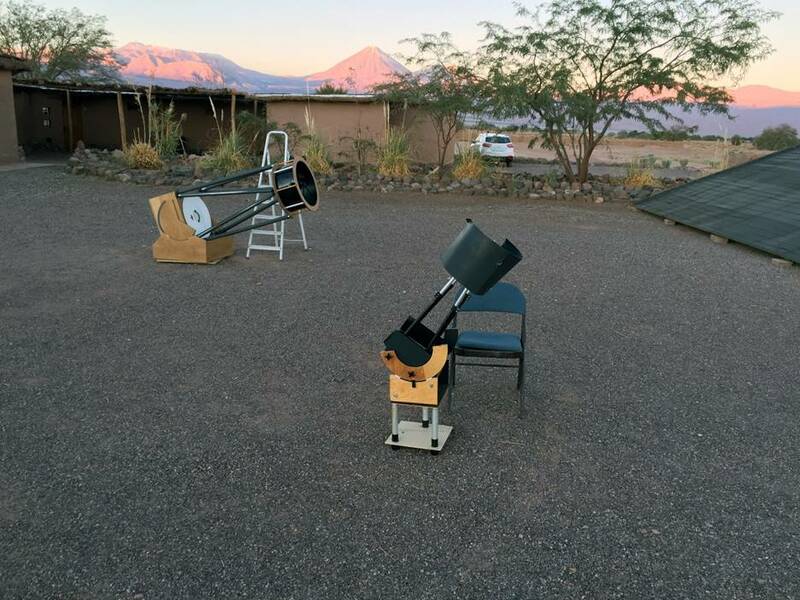 I spoke to a group of German astronomers in Chile who much preferred Namibia for their southern skies simply because the trip is so much shorter. However, South America clearly represents the most accessible southern sky to the North American observer. Flight time from the west coast of North America to Sydney comes it around is 15 hours by itself. Add in connections on either end and you can easily spend over 24 hours getting from your house in the United States to a dark sky in Australia. House to dark sky in northern Chile will be less than 16 hours under most circumstances. If you are staying for any period of time in either Buenos Aires or Santiago and need transportation into the city from the airport DO NOT JUST TAKE A RANDOM TAXI OR AGREE TO GO ANYWHERE WITH SOMEONE YOU MEET AT THE AIRPORT. You will be mobbed with such offers. In Buenos Aires you should book a car before entering the general airport area (but after customs, immigration and baggage claim). In Santiago you will, unfortunately, have to enter the swarm of the airport where people are trying to grab you and hustle you into their taxis. If that happens, you’ll likely pay a good deal more (like 500%) than if you get a legitimate taxi. The best bet in Santiago is a company called Transvip which has a counter immediately after you leave the secure area. If you’re making a connection to another city in Chile or Argentina, after you collect your bags in that city’s airport, head directly to the rental car counter to pick up a car. And you WILL want a car. Operating in unfamiliar territory always makes one feel a little uncomfortable, a little vulnerable. Unsafe. This is, of course, a perfectly fine way to feel and even helpful. When you don’t know the lay of the land it’s a good idea to be cautious. While neither Chile nor Argentina are absolutely safe – no place is, after all – they’re not unsafe, either. There is relatively little violent crime in either country. For instance, the homicide rate in Santiago is 3.90 per 100,000 while the same number in Buenos Aires is 4.90 and in New York is 5.10 (as in any city, these numbers are highly neighborhood dependent). So, as I wrote, it is not perfectly safe but touring either Santiago or Buenos Aires is a little less dangerous than touring similar cities in the United States. On the other hand, the risk of theft is, generally, higher. Pickpockets in both capital cities are common and skilled. Scams to separate tourists from bags are likewise much more common and elaborate than in the United States. So, to summarize: you’re much less likely to be killed or assaulted in Chile or Argentina than in the United States. At the same time, you’re much more likely to be separated from your belongings. You can find online really good tips to protect your valuables but, basically, use your head. Wallets in front pocket and never carry all your money or cards (or your passport) into the city or crowded situations. Don’t keep all your eggs in one basket, as it were. Wear both straps on backpacks. Don’t wear loose bags like purses. If seated don’t drape bags over the back of your chair. Don’t walk away from your bags, especially at airports or bus stations. You get the idea. Both Santiago and Buenos Aires have excellent public transportation systems. I highly recommend not driving in either city if you can avoid it. Compared to one another, Santiago is a peaceful Sunday drive to Buenos Aires’ chaos. When I wanted to leave the city while staying in Buenos Aires, I called a car to take me to the airport where I rented a car. When I did this I got lucky that the airport was on the edge of the city in the direction I was going. The guy who picked me up asked where I was going and I told him I was renting a car. He asked, “You don’t want to drive in the city?” I said, “No.” He replied, “Very smart,” as he looked straight at me in the backseat while accelerating through a red light. From the perspective of a small town American, the drivers are crazy there. But it’s a fabulous city and if you’re at all interested in touring cities, Buenos Aires should be high on your list. Seriously, I’m a country boy at heart and I can’t wait to go back. Driving in Santiago is a different story. On several occasions I rented a car near my apartment to make drives out of the city and had a fine time. Santiago is a very large city (population between six and seven million) so there is a lot of traffic and, at times, it moves very slowly. But it’s otherwise normal. Drivers keep to their lanes and obey traffic signals. I don’t find driving in Santiago any worse than driving in, say, Washington D.C. I just happen to not like driving in either (or any, really) city. Driving outside the cities of Chile is easy and enjoyable. The country boasts fine roads that are well marked. While traffic is never high, you’re also rarely completely isolated. If you have the time, it’s a great country for a road trip. The only negative I can think of is that tolls are higher than in the USA and much more frequent. This is especially true in and around Santiago but still true even in very remote places. Each capital city has great public transportation. If you’re staying in Buenos Aires or Santiago you can see the entire city easily using only busses, subway and an occasional taxi or Uber. And you’ll save yourself a lot of headaches. I include the above on the chance that your South America astronomy adventure includes some normal tourism. Or, that you’re doing normal tourism and want to throw in some astronomy. Both Buenos Aires and Santiago are wonderful cities in their way and offer a lot to a tourist. But, to state the obvious, neither city is a good place for astronomy. That is especially true of Santiago, which has notoriously poor air quality due to an ever present inversion layer along the Chilean coast (though I did track down the Jewel Box and split Alpha Centauri from the roof of my apartment building). So, you’ll want to get out of the city. Both Chile and Argentina have very comfortable long-haul bus systems. It would be easy enough to take a bus from, say, Santiago to La Serena. It’s about a six hour ride and you can do it reclined in what is, basically, the superior of a first-class seat on a plane. That would run you about $30. Of course, then you’re in La Serena which is also not ideal for observing. So, at some point, you’re going to need to rent a car. And, if you’re laying out the money to fly to Santiago, you can fly cheaply to a dozen Chilean cities on Sky Airline, which is a budget airline but very nice. In those cities you can rent a car. The point is: if your goal is to observe from a dark sky, you’re most likely going to need to rent a car and drive. There seem to be two types of traveling astronomer. There is the type that brings everything they own with the idea that, if you’re going on a once in a lifetime adventure, you want all your gear. There was a guy I met along the way in Chile that had brought four telescopes, five cameras and over 150 pounds of gear. Then there is another type that figures they’ll rent everything they need or just take a naked eye gander. Of course, there are many in the middle and my advice is that there is exactly where you wish to be. I’d recommend a travel scope of some sort so you aren’t dependent on the availability of rental gear. You should take binoculars you like. If you’re into imaging, there are some very nice small tracking mounts for wide angle photography that make a lot of sense. I used a Vixen Polarie and had good results. If you want to do highly advanced imaging I do think renting makes the most sense. Lugging expensive, delicate gear to another continent is not for the faint of heart. My travel scope is the home built Dob shown below. It disassembles in such a way that it can be packed in a suitcase (I carry the mirrors and eyepieces on the plane with everything else in checked baggage). If you build, you want the scope to be durable, hard to break and light. It’s also nice if it can be repaired with duct tape which I had to do twice. On the other hand, there are a variety of small refractors and reflectors that could easily be carried onboard a plane or packed with only slight modification. 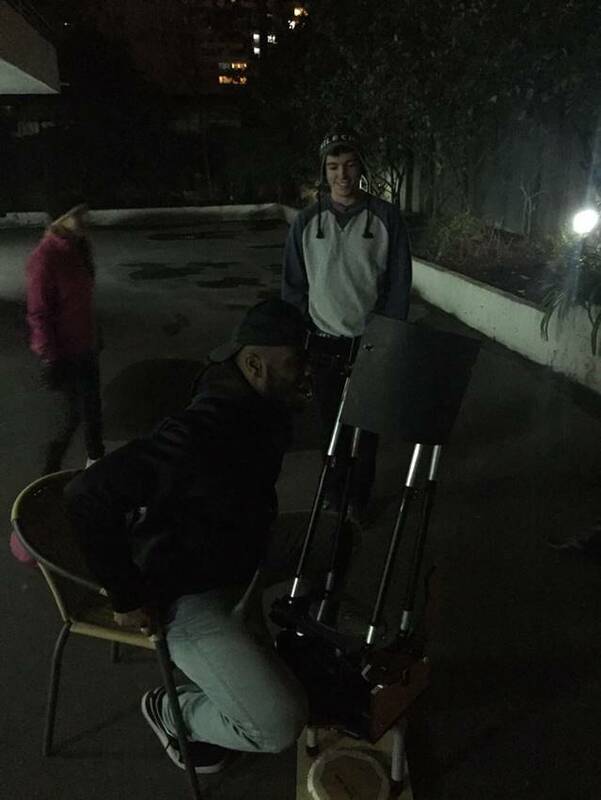 Students observing Saturn from my apartment in Santiago. Professional or on your own? I stayed at three different lodges specializing in astronomy. There are others in Chile, though I never found one in Argentina (I’m happy to be corrected on that). 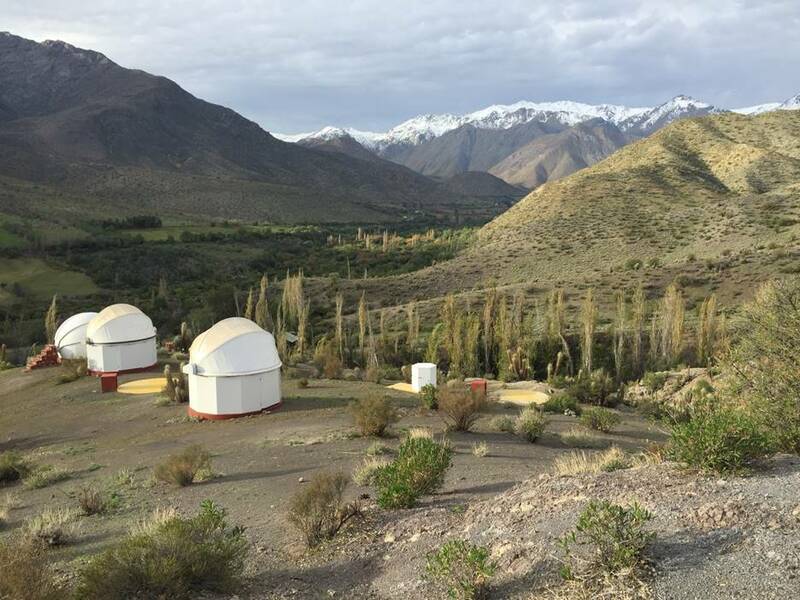 The places I stayed in Chile were: SpaceObs, which is outside San Pedro de Atacama; Hacienda Los Andes, which is in the Hurtado Valley, a couple of hours from La Serena or a six hour drive from Santiago; Los Nogales Roan-Jase, outside San Jose de Maipo, about an hour and a half driving from city center Santiago but reachable by public transportation. The author relaxing after several consecutive dry, clear nights at SpaceObs. The door to the lodge is open left of center. 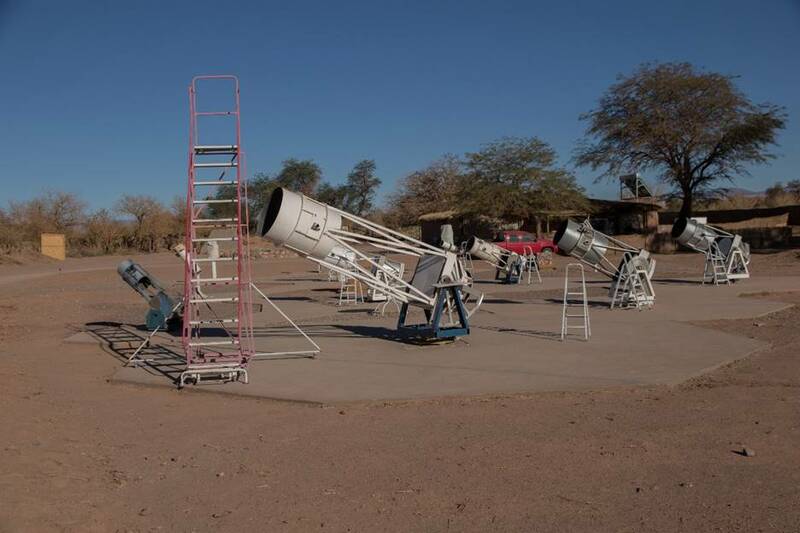 The telescopes used by SpaceObs for public tours. The 20” Dob we rented from SpaceObs and my homemade 8”. If you can’t tell, mine is in the foreground. SpaceObs runs nightly sky tours which I did on a second trip with a group of students. His tour is outstanding for the interested non-astronomer but, if you’ve experience, is a little basic for taste. Still, if it’s all you can manage, it’s a few hours out under a very dark southern sky with telescope time to boot. And it’s hardly a criticism, the tour is explicitly aimed at the newcomer and my students loved it. I sort of let them have it and moved off to the side by myself and lay down to watch the Milky Way rise to dominate the sky. San Pedro also offers amazing desert vistas and touring opportunities. If you go, don’t fail to make a couple of trips around the area. Valley of the Moon and Ojos de Salar were particular favorites. To reach SpaceObs and San Pedro de Atacama, you need to rent a car at the Calama airport and drive southeast for a little more than an hour. It’s a staggering drive as there are places along the moonscape where it is impossible to see a living thing you didn’t bring with you. The flight to Calama from Santiago is almost three hours. In principle, you could drive from Santiago but if you’re up for that you probably don’t need to be reading this article. It’s a long way. The second place I stayed is less well known – or, at least, I didn’t hear of it until I was nearly in Chile – and is further south. 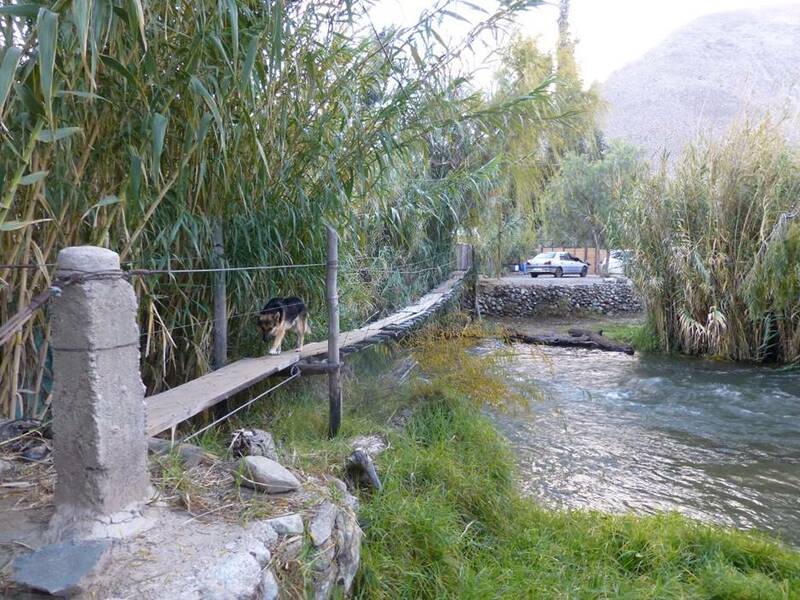 It is Hacienda Los Andes just west of a town called Hurtado in a valley of the same name. If you search on google maps for a route from La Serena, it will take you far out of the way, south to a city called Ovalle, which looks far out of the way. However, the more direct route is through the Elqui Valley, which, while one of the most visually impressive drives I’ve ever made, is very steep and windy and gravelly. It actually is faster to go the long way on paved roads. I made a second trip to the Hacienda and drove from Santiago. That was actually faster than flying to La Serena and renting a car there and gives you a nice view of the Chilean countryside. The cost was also a wash. From my apartment in Santiago, it was a little over six hours to the Hacienda. From the airport, it’s five and a half. Rented 12.5” Portaball at Hacienda Los Andes. My Vixen Polarie imaging rig is set up next to the cement table which has several AC outlets. 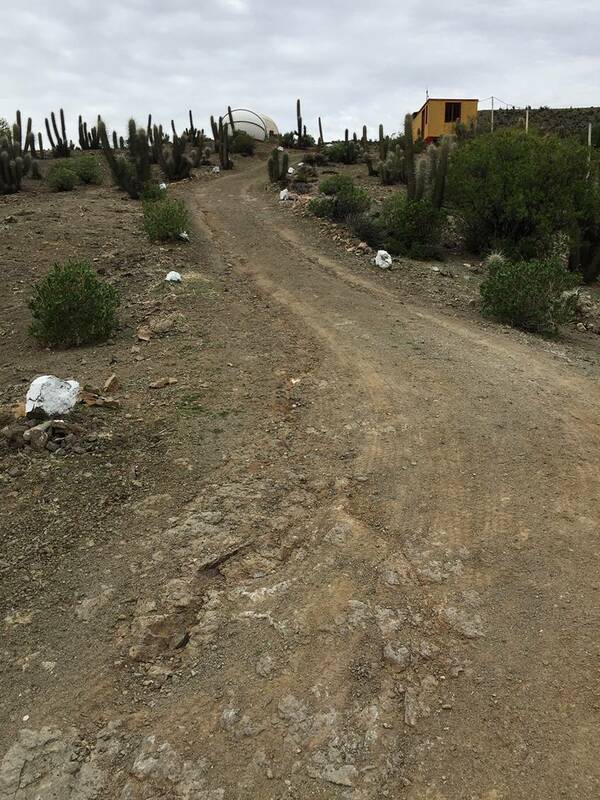 The walk up to the observing field at Hacienda Los Andes. Looking down at the observing field at Hacienda Los Andes. 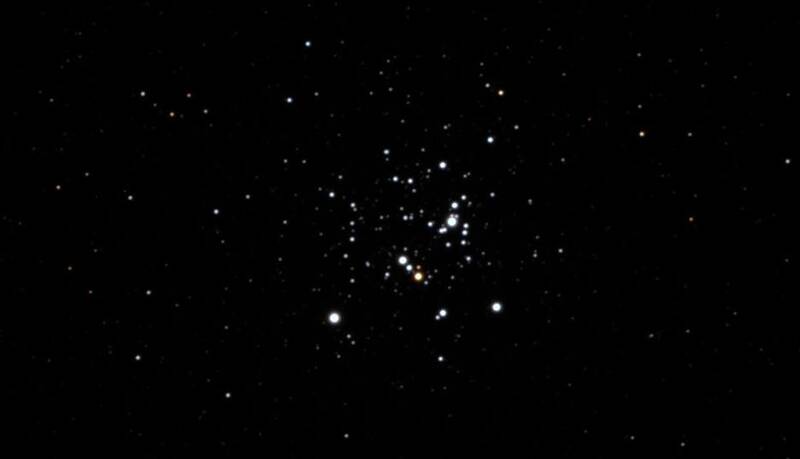 The Jewel Box cluster imaged with the TEC200 shown above. There are several hiking trails that leave the Hacienda. One is a solar system tour where you can experience the relative size of the solar system while taking in the pre-cordillera scenery. The Hacienda is a much “nicer” lodging place than SpaceObs. The SpaceObs lodge is perfectly nice but Hacienda Los Andes has long been a lodge/restaurant and most of its guests are not astronomers. However, the place is kept dark and the observing field is about 200 meters up the hill from the lodge so local lights aren’t a problem. Hacienda has about the same size light dome as SpaceObs but its dome is caused by a larger city (La Serena) that is farther away. Both sites are very dark. Hacienda gets something like 280-300 clear nights per year, though I was unfortunate enough to experience three in a row in late June. Winter clouds are apparently not uncommon. On my first visit in March, I rented a 12.5” Portaball that was wonderful to use. I also rented a “pad” which is just a cement circle 12 feet in diameter which has AC power. I was able to run my imaging rig from the pad while I observed. Most astronomers visiting the Hacienda appear to be imagers and most of the rental gear there is imaging gear. 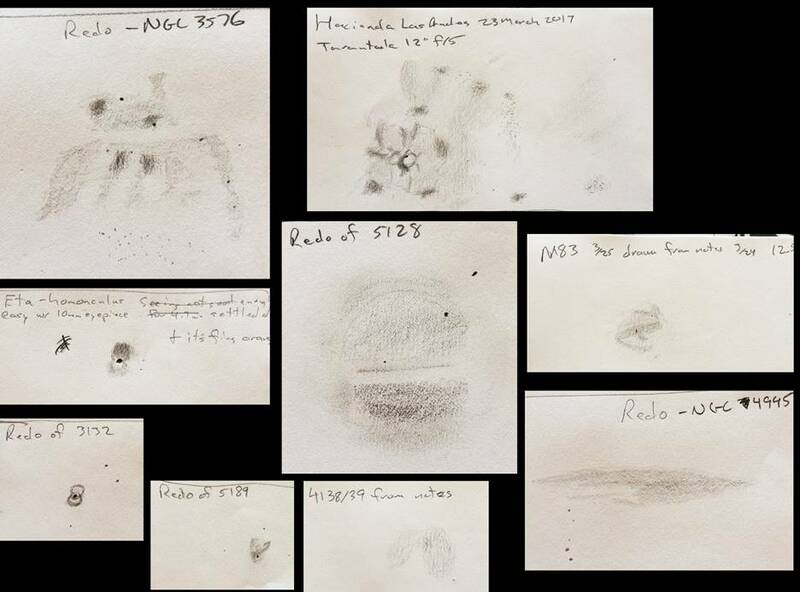 I learned that my March weekend was their first that was entirely booked by astronomers, some of whom had hauled hundreds of pounds of gear with them. I was the only visual observer. 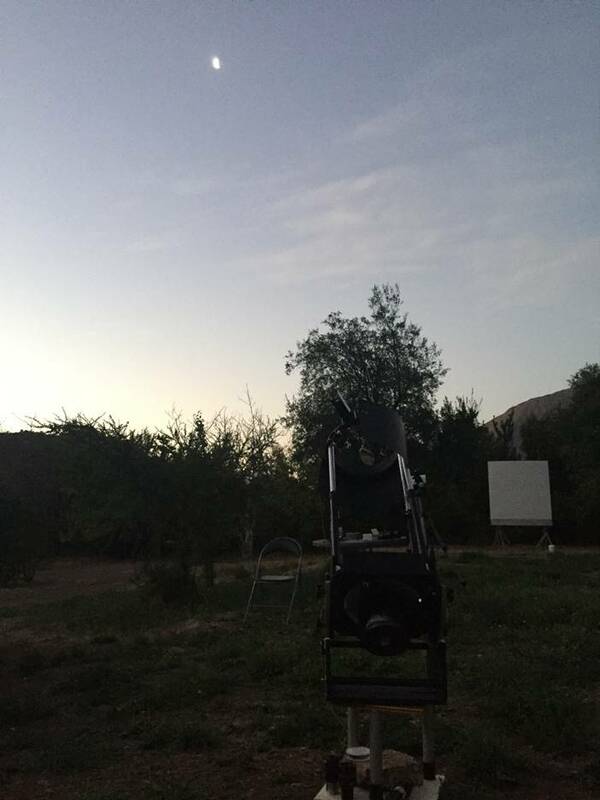 At both SpaceObs and the Hacienda I had three nights of outstanding observing with excellent gear, power and a comfortable room a few steps away. If you’ve contemplated southern observing as long as I have, you couldn’t ask for better. Each was simply a spectacular astronomical experience in all respects. The third place was also excellent with one significant caveat. Los Nogales Roan-Jase is located in El Cajon del Maipo, about 1,500 feet higher than Santiago in the Andean pre-cordillera. It was just under an hour and a half drive from my apartment to the inn, which meant I could comfortably take a lot of gear and food. That hour and a half drive equates to about 40 miles from city center and, perhaps, 25 from the edge of the city. If you’re thinking that that doesn’t sound far enough to avoid significant light pollution, you’re correct. Roan-Jase has a light dome in the northwest that extends more than 45 degrees up. The location is also not of sufficiently high elevation to be completely over the inversion layer in winter which lowers transparency. It didn’t have this problem in summer and fall, where I found crystal clear skies. My cabana and rental car at Los Nogales Roan-Jase. My homemade travel Dob ready to go at Los Nogales Roan-Jase. The roll-off roof observatory (closed) at Los Nogales Roan-Jase. With that said, the inn has very comfortable cabanas and an observatory. I didn’t rent any gear there but it is available. Instead, I used my travel Dob and portable imaging rig. To the south, the sky is very dark. Over the months I was in Chile, I had three really good nights at Roan-Jase. Clear skies aren’t as common at Roan-Jase as at the Hacienda or SpaceObs but, outside of late fall and winter, it is very often clear. 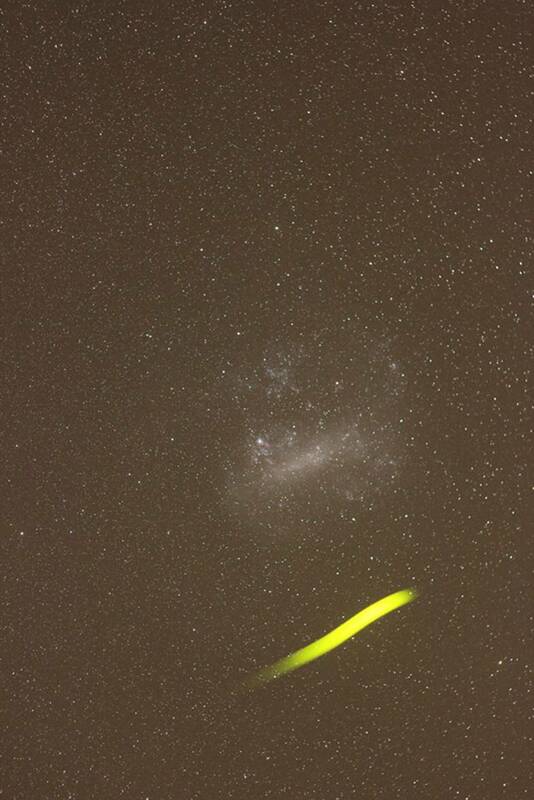 Obviously, based on light pollution you would choose either SpaceObs or the Hacienda for a dedicated observing trip. But if you find yourself traveling to Santiago for business or pleasure, Roan-Jase offers an excellent chance to get out under a good southern sky and rent gear. You would also save on the expense of an internal flight and, perhaps, a rental car. Roan-Jase can be reached by public transportation from Santiago. 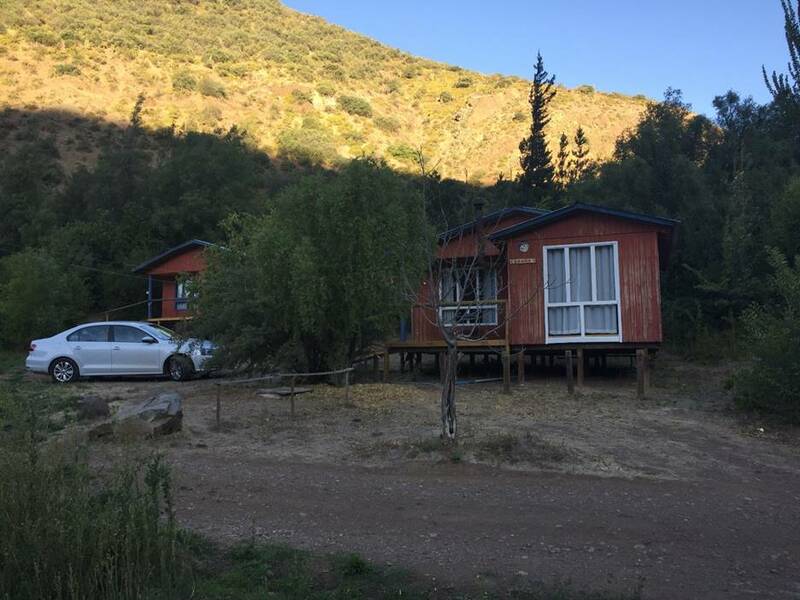 They will provide details but, basically, you take the metro to the penultimate stop on line 4 and then hire a colectivo (group taxi) that runs up and down Cajon del Maipo. That gets you to the inn for about three dollars. The inn has a restaurant where you could buy meals. The village of San Alfonso is about a mile up the walkable road where you can find a variety of other restaurants and businesses. 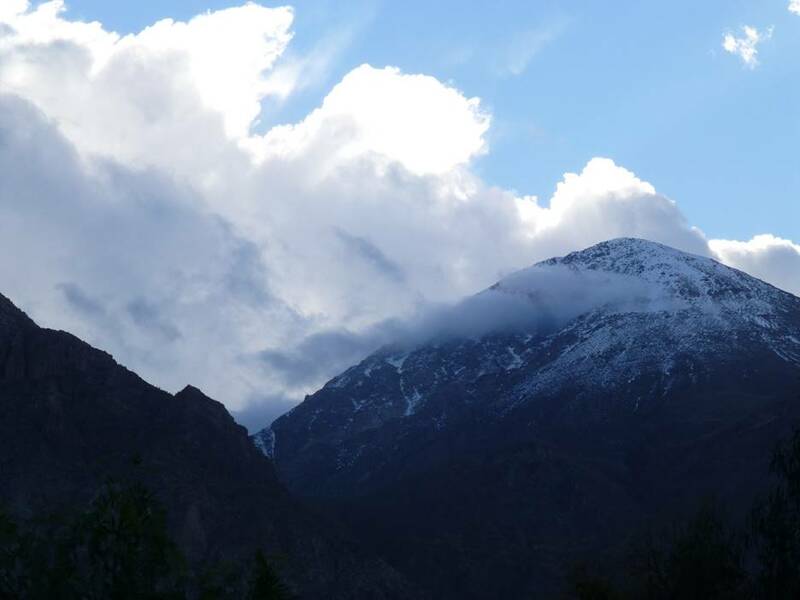 Cajon del Maipo is a fantastic area to tour, hike and horseback ride as well. If you find yourself trying to decide between SpaceObs and the Hacienda, I think you won’t be disappointed in either place. The Hacienda is a more comfortable place to stay and an incredible breakfast is included in the price of the room. You can also eat dinner and lunch as they run an excellent restaurant open to guests and non-guests alike. The property has acres of fresh fruit and an avocado tree above a hammock. They serve fresh squeezed juice picked that morning. At SpaceObs, you’ll cook your own meals but the lodge comes with a very nice kitchen and San Pedro, being a hot tourist destination, offers much better restaurants outside the property than are easily available outside the Hacienda. Of course, this is about astronomy, right? Both sites are excellent and the hosts set you up with all you’ll need and work well with you by email. The only real difference is in chance of clear sky, which is pretty equivalent outside late fall and winter. During these times, the Atacama is a clear favorite, pun intended. I dare say most of your observing at home is done just by driving out in the boonies on your own and setting up. If you have your own gear, this is a viable option in either Argentina or Chile. Camping is common in the Atacama and you can even rent 4-wheel drive vans outfitted for sleeping (see “Wicked Campers” in links). I wish I had done this in the Atacama as I could have pushed a little higher and darker. Of course, heading out on your own in a foreign country is intimidating and safety should be considered. But a LOT of people, most non-astronomers, do this without incident. By far your biggest worry camping in the Atacama is water as it is very, very dry. My friend and I, in three days at SpaceObs managed to consume about 40 liters of water and neither of us would claim to have been satiated. A place I wish I had tried to camp and observe was near Cerro Paranal outside Antofagasta. I visited the ESO observatory here toward the end of my time. While the coastal city lay under the inversion layer that pervades nearly all of the low lying coastal areas of Chile, the observatory, at 8,000 feet was clear as a bell. The tour guide, a local astronomy professor, said the site gets 330 clear nights per year. He further said you could sleep in your car basically anywhere in the area. His advice was to pull off the main road 100-200 meters and set up. It would have been great and I hope to get a chance to take his advice someday. Such a strategy should work essentially anywhere in the high Atacama. 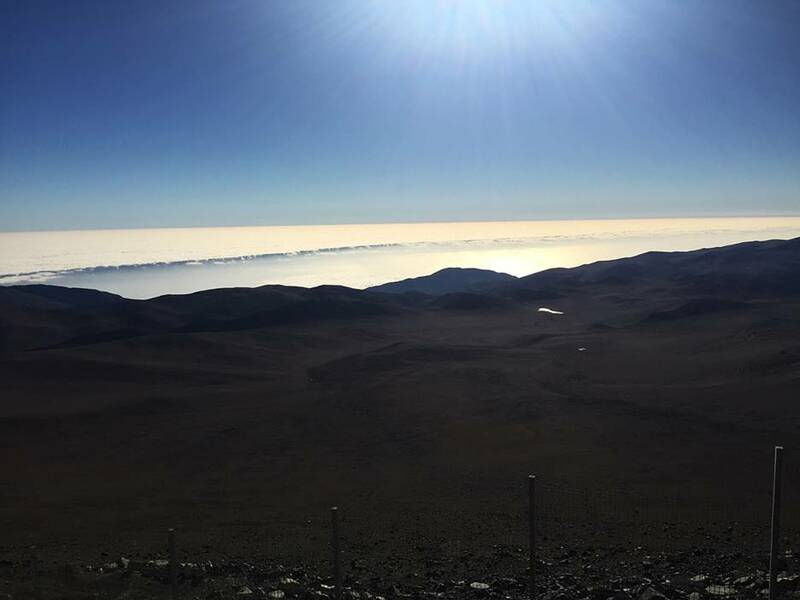 Looking down from Cerro Paranal toward the coast and the ever present inversion layer. The land around the mountain is dry, empty desert perfect for astronomy. Incidentally, the Paranal tour is fabulous. 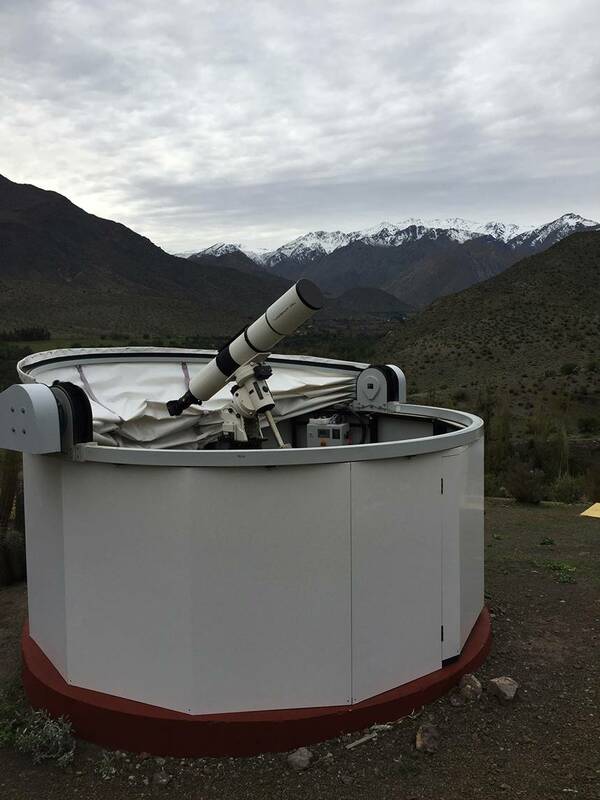 It was the only observatory I toured while in Chile but there are a number to choose from. If you like seeing giant telescopes, you can do so. But I find seeing a giant telescope I’m not allowed to use usually just makes me a little sad. You can also book non-astronomy specific lodging and make due. I did this twice. The first time I booked an airbnb ranch house southwest of Buenos Aires and got lucky in having two perfect nights. The landscape reminded me a lot of where I grew up in western Oklahoma with the exception that the locals didn’t light their property up the way we do back home. I asked the owner of the ranch about the lights and he said, “Lights are bad for the animals.” Wise man. Where during the day I had seen numerous ranches surrounding the one where I was staying, at night I saw no sign of any of them. Regardless, there was a serious light dome to the northeast caused by Buenos Aires but overhead and south – where I wanted to look – was quite dark and it was very easy to get dark adapted. Just like home. Flat and dark. The clouds dissipated right at sunset. 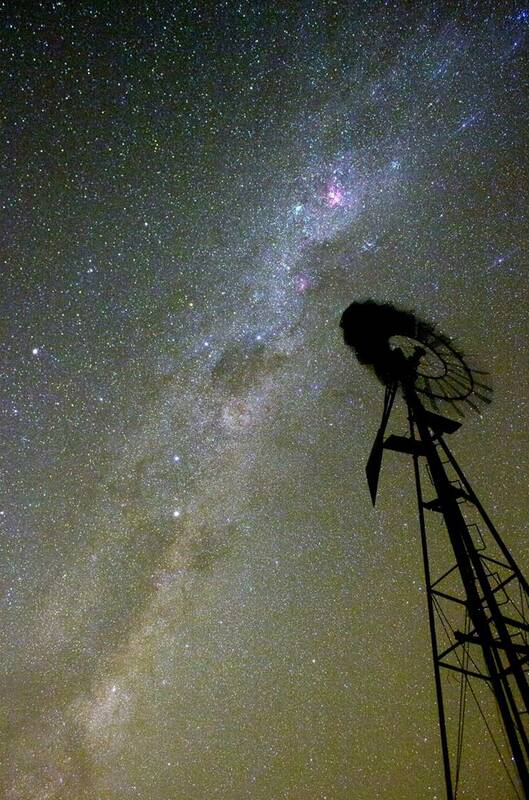 The Milky Way rising over the windmill. This photo is a single shot with a dewy 18mm lens. 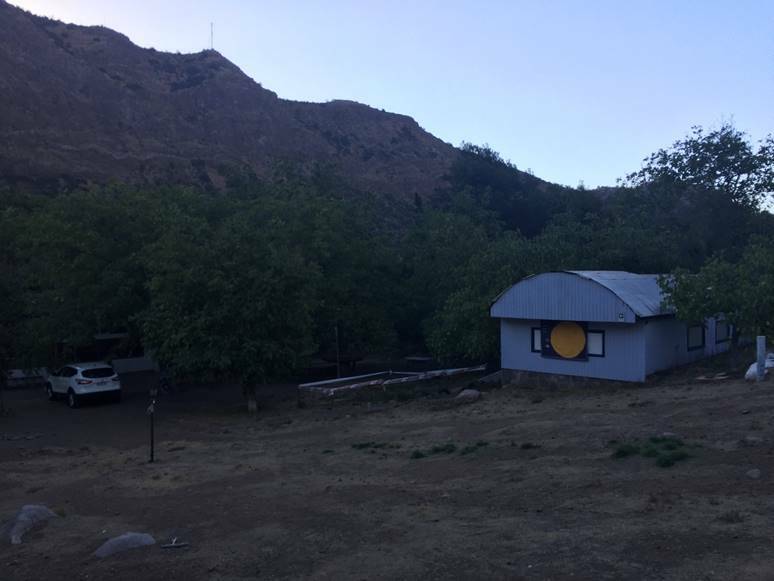 The second non-astronomy lodging was in the Elqui Valley in Chile. I booked a room on along the Rio Claro in the town of Rivadavia. I was able to set up outside the room and, again, had little trouble with local lights. The owner was very accommodating to my request to extinguish the one dim outdoor light that was present and the property was well isolated from neighbors who, in any case, had not installed bright lights. Again, I had two great nights of observing and imaging. If and when you select a room in a town, be sure to do your homework. Some of the larger towns have significant local light pollution. 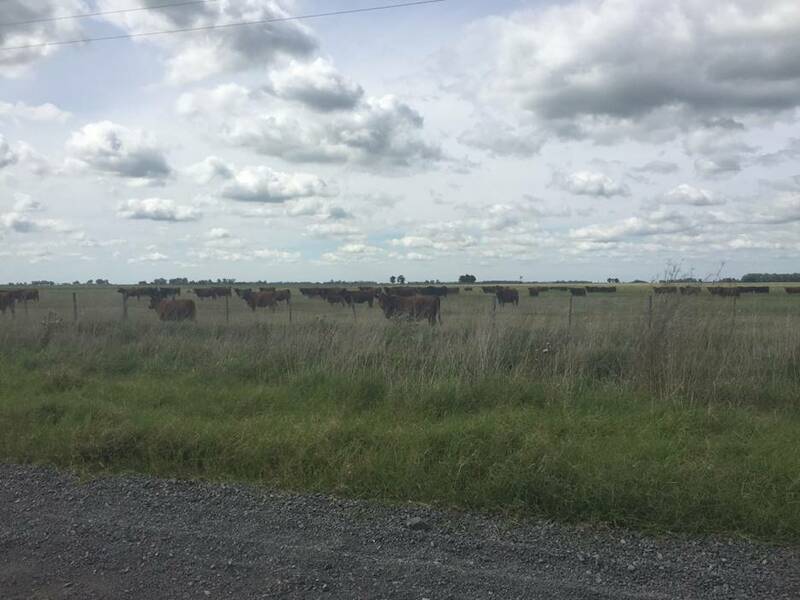 There was a Cloudynights thread from March with a member visiting Vicuna, about 20 miles west of Rivadavia, and he reported skies that were not so good. Looking at my observing spot from across the Rio Claro. It was a lovely place from which to watch the universe but may have been the only place in all of dry northern Chile where I could dew up a lens. The view from the observing spot in Rivadavia. Obviously, I would like to have been higher up under darker skies in both those cases but the comfort and security of being right outside my room was worth a lot and the skies, while not pristine, were far better than my usual skies at home in the United States. 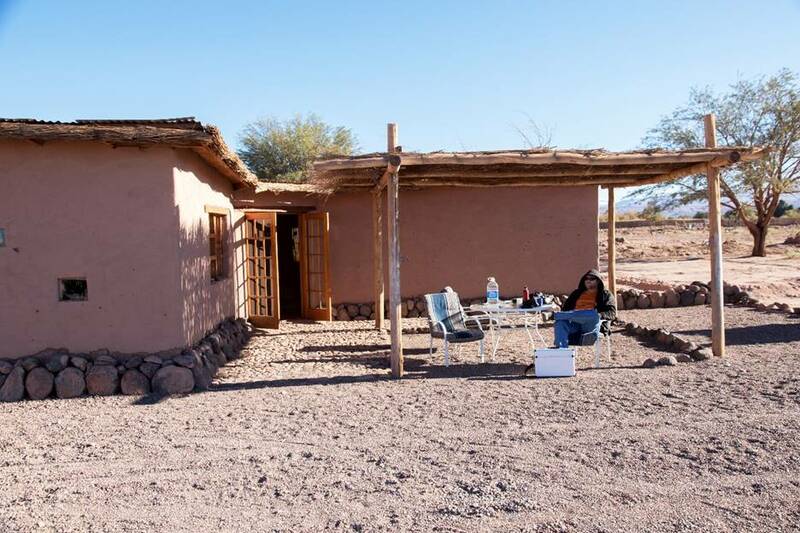 If you’re going to South America for a short trip focused on astronomy, I think it’s clear that it makes sense to pay for a dedicated astronomy lodge either in the Atacama (anytime) or the Hurtado Valley (outside of late fall or winter). This gives you an excellent chance at clear skies and you will have good equipment and skies available in a secure location with staff that knows the skies and the area. On the other hand, if you’re interested in a longer trip that includes significant “normal” tourism, it is possible to go it alone either by camping or booking a rural room. We all observe or image in our own way and you should certainly pursue your interests in the south just as you would at home. However, keep in mind that while you may now have much better knowledge of gear and technique than you did when you started in the north, in some ways you will be back to being new. I got very lucky in how my South American observing went. I spent the first month of my time in South America in Buenos Aires and, truly, I didn’t think I’d get a chance to observe. The schedule was packed and I knew the city wasn’t a good observing spot. I could see the Southern Cross and Alpha and Beta Centauri from my balcony and I thought that was pretty cool. However, given the situation, I left my travel dob in Santiago. I did take the imaging rig as I needed a camera for tourism and the Polarie itself doesn’t take up much space. 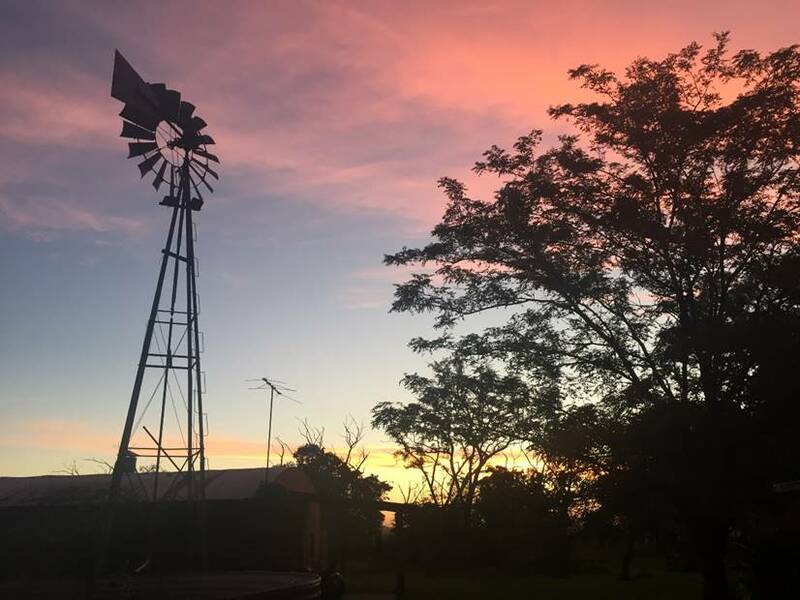 Suddenly, a couple of weeks after arriving, I found myself with a free weekend forecast to be clear and I managed to get myself out into the pampas where I stayed in an old ranch house owned by a wonderful family. They were fascinated by my imaging rig and hospitably invited me to dinner. Everything you’ve heard about Argentine beef is true. I set up my imaging rig and got some great shots of the Milky Way and LMC. My main point in this section is that I had only a pair of 10x50 binoculars for visual observing which forced me to learn my way around the southern sky. This was badly needed because I was quite lost. Two nights of naked eye and binocular observing got me well oriented so that when I finally had a clear night with my scope, I was able to find the many objects I longed to see. This is the advice we give all newcomers, of course: learn the sky, then use a scope. Just keep in mind that with completely new sky to observe, you will likely be back in that position no matter how experienced a northern observer you are. Moreover, the southern Milky Way is an unbelievably impressive naked eye and binocular sight and is well worth a long, lingering look. Once you’re oriented, use a guide to find your way around. I devoted one night to taking in the famous showpieces (Eta Carinae, Omega Centauri, the Magellanic Clouds, Jewel Box, etc.) and returned to them often but made a point of digging out lesser known objects just as I would at home. But I needed some help finding the many, many excellent objects sprinkled like candy around the famous jewels of the southern hemisphere. The guide I used (link below) was written by Leo Cavagnaro, a friend from Mendoza. There are others. The point is: while a plan is always useful in the field, under a new sky it is essentially mandatory. If you have but a single night or two, obviously use a scope and keep to the famous showpieces. But if you can arrange it, use one night to just get acquainted with the new territory before diving in and find some time for lesser known objects. I won’t include all of my observations but will include a few to whet your appetite. But, first, let me just say that the stuff you’ve always read about are as good as advertised. Eta Carinae is simply phenomenal. I kept coming back to the Jewel Box every night and even made a point to hunt it down from Santiago where it acquitted itself admirably even through the smog and lights. And I’m not really an open cluster guy. Speaking of open clusters, the southern sky is full of them and they’re incredible. Omega Centauri, which I’ve often seen low in the south from home, is an easy naked-eye object and definitely non-stellar. At 60x in the 12.5” Portaball at Hacienda Los Andes it is beautiful beyond words, the eyepiece swarming with stars with patterns forming and dissipating in your mind constantly. The Magellanic Clouds are a treat at any magnification, including 1. Quite striking next to the Small Magellanic Cloud is the globular cluster 47 Tucanae which, if it were located in the northern hemisphere, would easily be the finest glob we could see. Only sharing sky with Omega does it finish second. 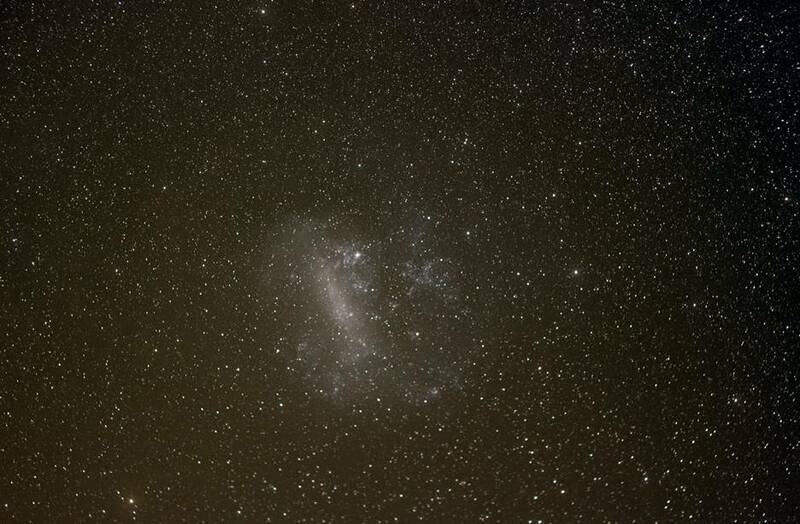 Cruising the area around the Tarantula in the Large Magellanic Cloud is mesmerizing. At 160x, the Tarantula Nebula is a looping mass of gas that pushes waves of light through the field of view. Both Clouds afford hours of entertainment by simply scanning back and forth. If you're an observer and you like nebulae, you owe it to yourself to see the Tarantula through a decently large scope. Neither it nor Eta Carinae have as great a surface brightness as M42 (though they’re close) but they provide much more detail. Given that the Tarantula is actually in another galaxy, it's even more impressive. 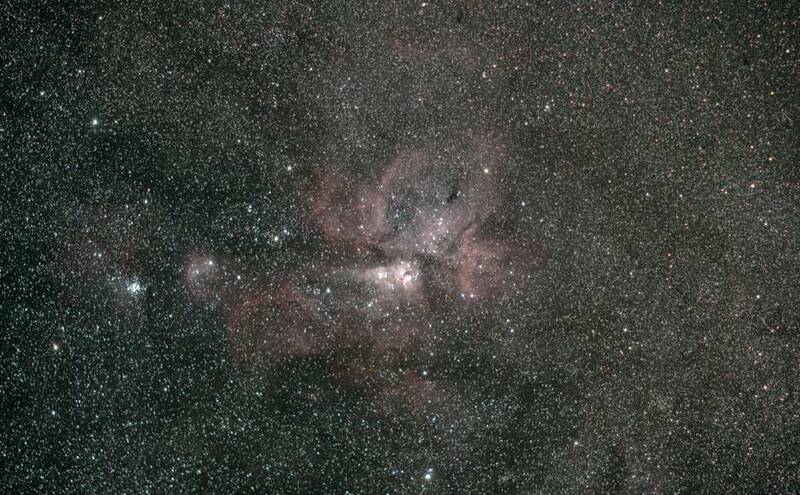 Speaking of Eta Carinae, it's an amazing complex of nebulosity. No part is super bright but the brightness stays pretty even throughout a degree wide field and it is incredibly rich in detail and dark lanes. And it is enormous. You'll be tempted to keep the magnification very low. Don't! The Homunculus nebula around Eta itself is easily visible at high power and shows definitive color. It is plainly visible at 160x and striking at 340x. And it's orange. Very, very orange. One of the few unfinished items on the list was to attempt to image the Homunculus with my planetary imager but I was clouded out of that attempt. If anyone goes (or is down there), it would be a great target for such a camera. NGC 3132 is called the "Eight-Burst nebula" for obvious reasons. The two intertwined rings (a trick of perspective) are clearly visible when the seeing settles at 160x in the 12.5”. At 340x there is some detail inside the rings but it was just at the edge of my vision and I couldn't quite nail it down. NGC 5189 is another odd shaped planetary. This one looks a bit like a small tornado and the bright leading edge has a twisted look to it. There are brighter clumps interspersed with fainter clumps and a fairly bright tail curving around a star of 11th magnitude or so as seen in the 20” from SpaceObs. Some sample sketches made during my time in South America. NGC 4995 is a spiral galaxy we see edge-on. In this case, the lens is having a gas and dust issue on one of its flanks which was plainly apparent in the eyepiece. I knew nothing about it but was guided to the galaxy by my friend Leo's handbook. I like to look at an object for the first time before reading a description so as not to see things with my imagination. I was gratified to read in the handbook after observing it that the galaxy does indeed have a quarter that is mostly obscured by dust. This may be my favorite (that is I think it most accurate) sketch of the set shown above. I was also able to find and detect needle-like parts of the Vela supernova remnant. I could really only hold them with averted vision and an O-III filter at low power. There were hints of delicate detail but it continually evaded close scrutiny. I made many more observations and could go on at great length. I tracked down Proxima Centauri and logged that I had looked at every bit of the southern sky with the naked eye. Thus, I have now seen the entire universe. I also spent considerable time in Sagittarius and Scorpius, two constellations I know well from home but which are never very high. 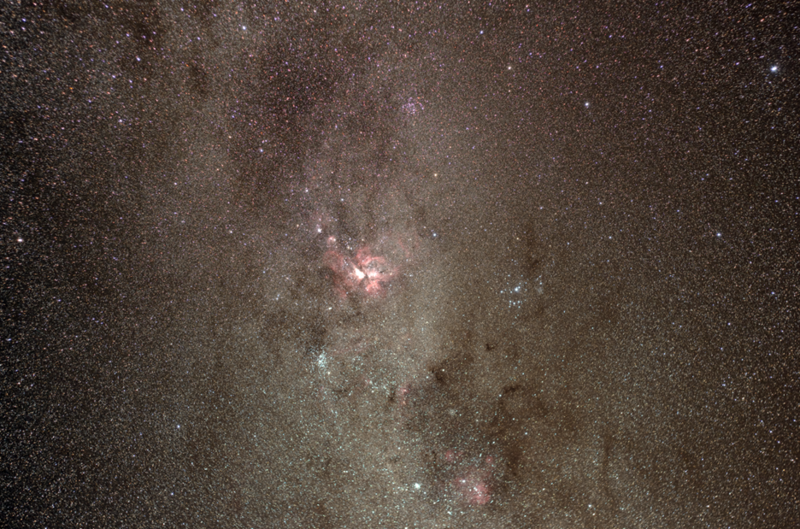 I watched the Trifid and NGC 6520, two long time favorites, pass nearly directly overhead. I spent a half-night studying the area around Zeta Sco. 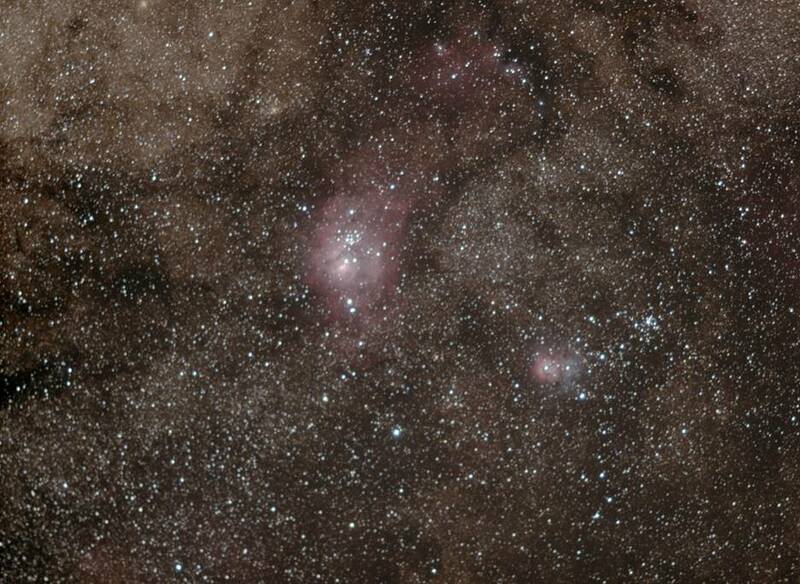 This includes NGC 6231 which is an extraordinary open cluster. 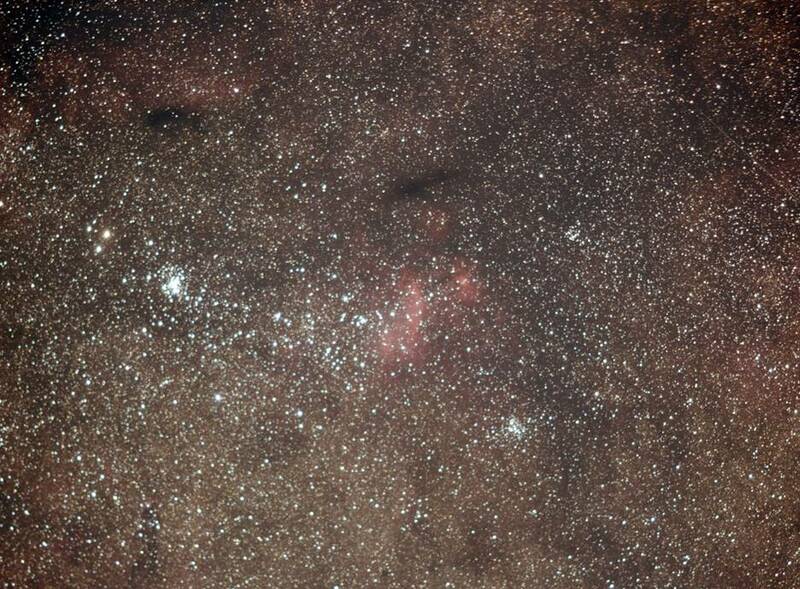 I discovered on an image of the area the nebula IC 4628 which was very bright on images with my modified DSLR. On a lark, I went to “hunt” for the nebula using the wide-field of my little homemade Dob and found that it was an obvious, even impressive, nebula. The Bug Nebula, which, again, I have seen from home, was an amazing little planetary that hinted at significant detail. My favorite Scorpius memory, however, is simply lying back as it crossed the meridian and taking it all in straight overhead. As I have alluded to, I took with me a Vixen Polarie and my modified Canon T2i. I took the 18-55mm stock lens, a “nifty-fifty” (50mm, f/1.8) and a Canon 200mm f/2.8 lens. Together with my travel Dob, this made for a complete outfit that was easily transportable. All optics and camera body I carried on the plane while tripods and sturdier parts of the telescope I checked. On short, internal trips, I was able to carry everything on the plane; who needs extra clothes? I also got very lucky with where I set up. All three of the astronomy inns I visited made provisions for AC power on the observing field so I was able to power the Polarie via the 5V USB port and keep camera batteries charged so that I could easily image all night. I was also able to use a computer to control the camera which made focus and framing much easier. Here you’ll definitely want to practice if, as in my case, you don’t often image with your portable rig. The one big change is, again, you’re in unfamiliar sky. And there is no pole star. I mean that almost literally. Where is the southern celestial pole? Find the big blank spot in the sky and it’s in there. There are, of course, stars near the pole but they’re at the edge of naked-eye visibility and you won’t know them. I watched folks who live in the southern hemisphere polar align accurately about as fast as I can in the north but it’s because they KNOW those stars. Inspired by PoleMaster, I rigged a way to put my planetary cam on the Polarie and use it with a CCTV lens to sight on the pole and got reasonably good at it. But my best advice here is to start slow. If you have a set of images you want to take with such a system that spans 18-200mm, start at 18mm. By starting with the wider fields you give yourself an opportunity to slowly improve your ability to polar align in a strange sea. After that, it’s just like back home. Oh, except for flipping the switch from N to S. You’ll probably forget that which will provide those around you with 5 to 10 minutes of entertainment. I know I did. A single 60s sub-frame of the LMC at 50mm from near Canuelas, Argentina in February. The fireflies were thick this night and I caught several that I didn’t detect until stacking. The SMC, 47 Tucanae and two fireflies. 50mm, f/2.8, 60 seconds. Crux and the Coalsack. 50mm, f/2.8, stack of 41 60-second subs. The Large Magellanic Cloud from near Canuelas, Argentina in February 2017. 50mm, f/2.8, stack of 41 60-second subs. 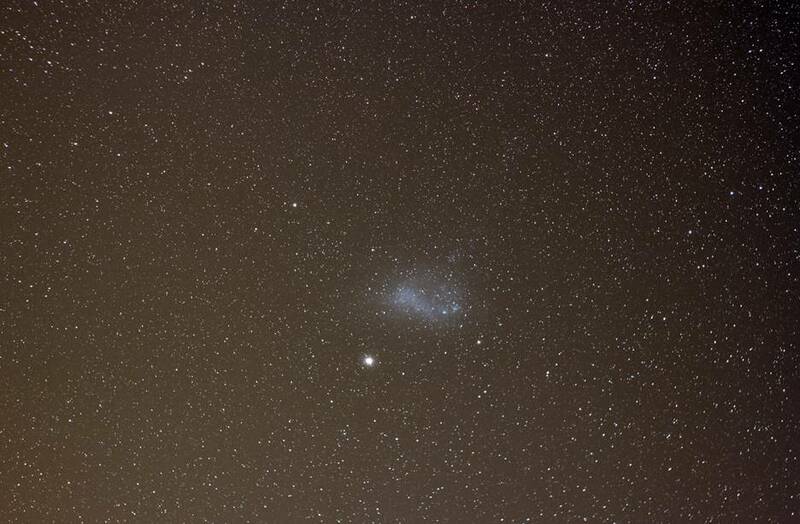 The Small Magellanic Cloud and 47 Tucanae. 50mm, f/2.8, stack of 41 60-second subs. Eta Carinae from Los Nogales Roan-Jase in Cajon del Maipo south of Santiago. March 4, 2017. 200mm, f/2.8, stack of 49 60-second subs. 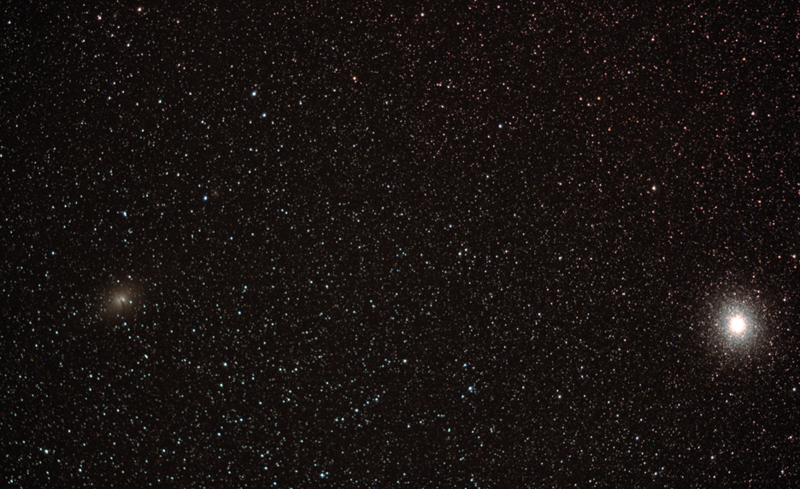 Centaurus, Crux, Carina from Hacienda Los Andes. 18mm, f/4, stack of 43 180-second subs. Eta Carinae from Hacienda Los Andes. 50mm, f/2.8, stack of 30 120-second subs. 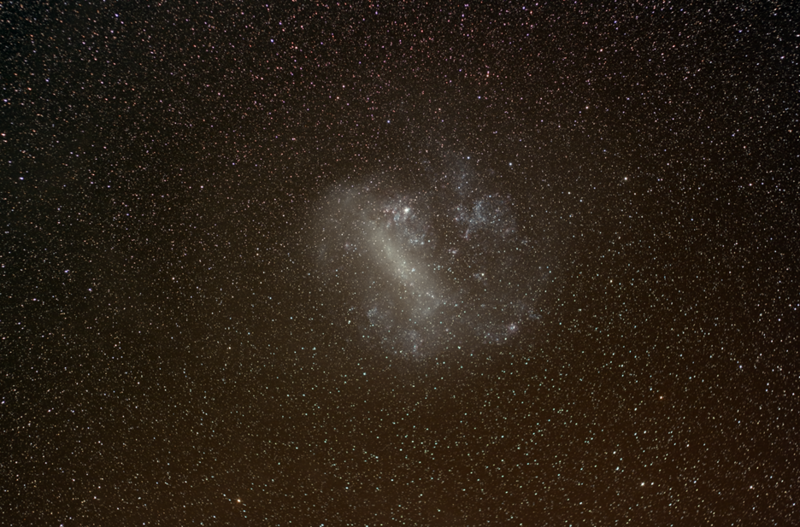 Large Magellanic Cloud from Hacienda Los Andes. 50mm, f/2.8, stack of 40 180-second subs. 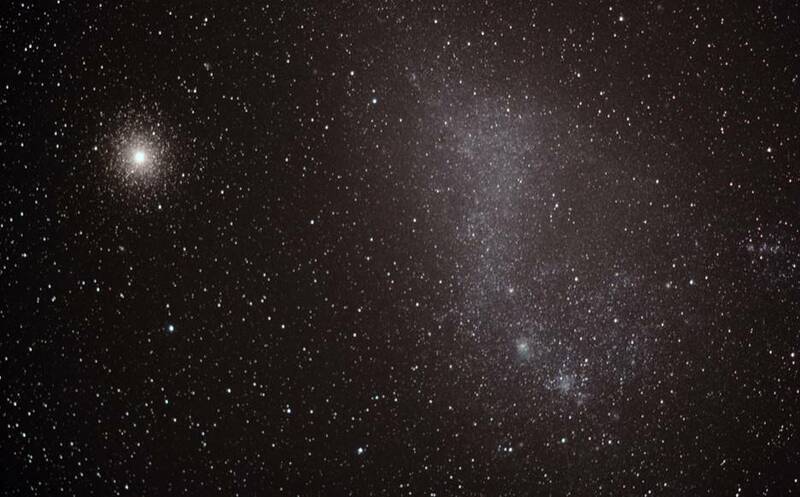 Omega Centauri and NGC 5128 from Hacienda Los Andes. 200mm, f/2.8, stack of 26 45-second subs. Crux, coalsack and “Dark Doodad” from SpaceObs. 50mm, f/2.8, stack of 80 120-second subs. Three panel mosaic from Scutum to Centaurus. 35mm, f/2.8. Each panel is a stack of 12 120-second subs. From SpaceObs. The Scorpius panel from the mosaic above. 35mm, f/2.8, stack of 22 120-second subs. Antares, M4 and the Rho Ophiuci complex from SpaceObs. 200mm, f/2.8, stack of 141 60-second subs. 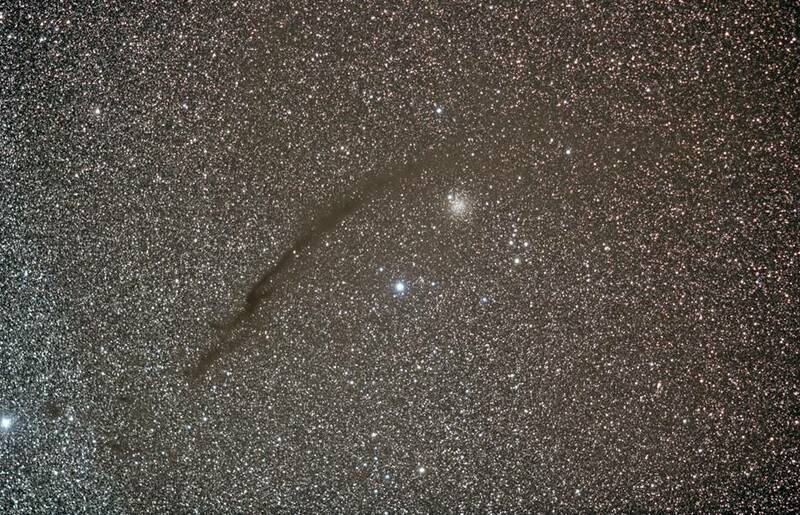 The Dark Doodad and NGC 4372 in Musca from Rivadavia, Chile. 200mm, f/2.8, 181 30-second subs. 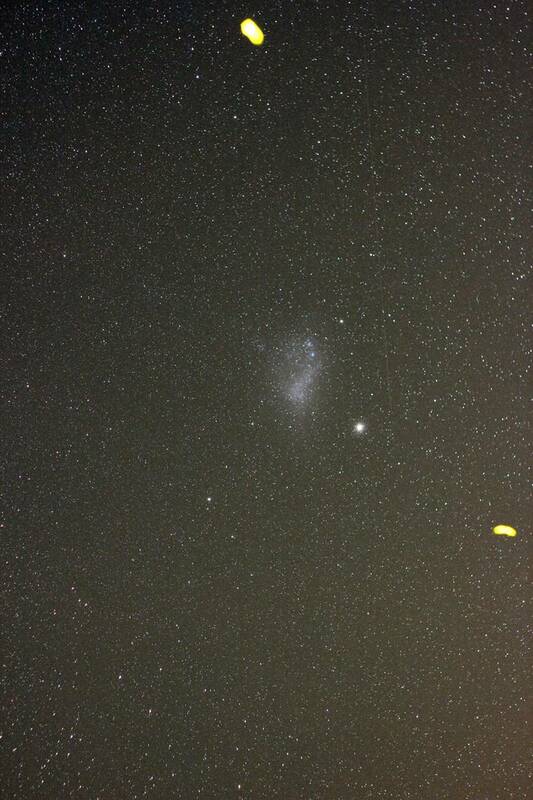 The Small Magellanic Cloud and 47 Tucanae. 200mm, f/2.8, stack of 30 45-second subs. July 1, 2017 from Los Nogales Roan-Jase. Zeta Sco, NGC 6231 and IC 4628 plus many other open clusters. 200mm, f/2.8, stack of 100 45-second subs from Los Nogales Roan-Jase. June 30, 2017. The Lagoon and Trifid nebulae from Los Nogales Roan-Jase, July 1, 2017. Stack of 103 45-second subs. I was fortunate to have an opportunity few will have, to spend many months in the southern hemisphere and I feel like I took great advantage not just to tour the planet but the universe. It’s unlikely you will get the chance to spend so long away from home but I hope that this article encourages you to try to see the southern sky. Seeing the “rest of the universe” really adds perspective to what one can observe from a single spot on Earth. 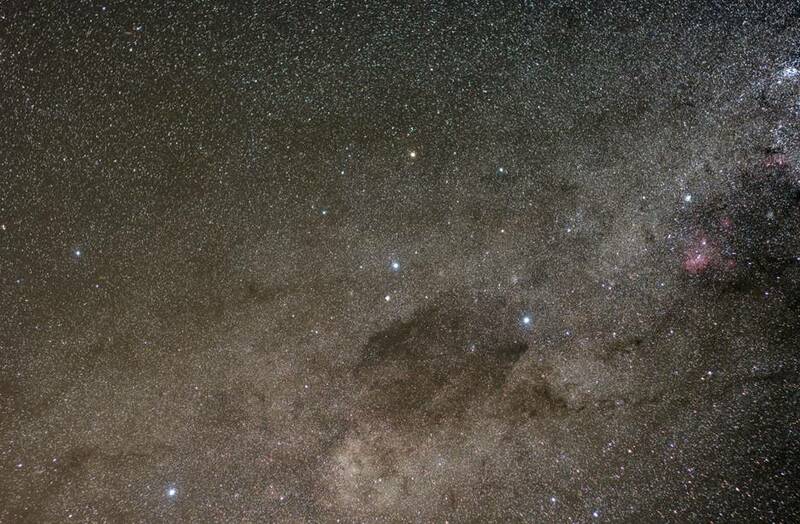 For instance, Antares is as close to Alpha Centauri as it is to the Scutum Star Cloud, which I would never have guessed. 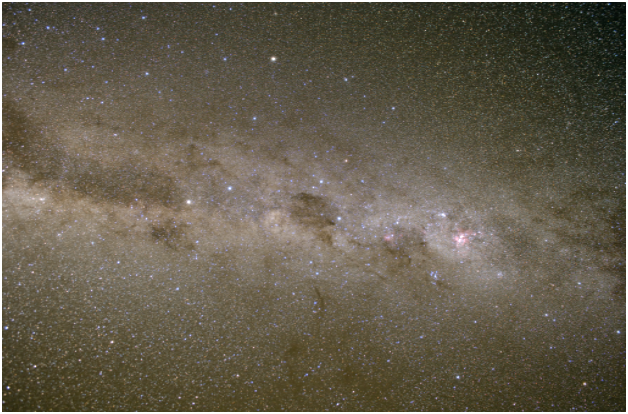 Our nearest neighbor will forever be a part of what I “see” when I look at the summer Milky Way from the northern hemisphere. 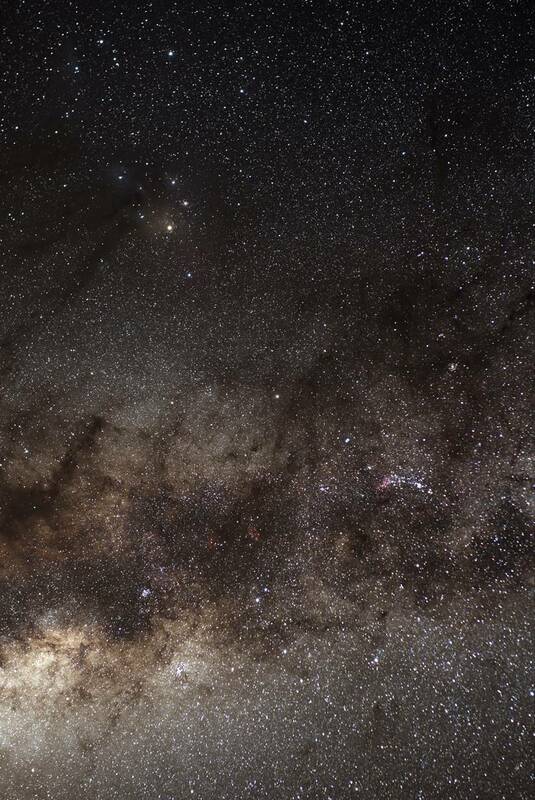 Moreover, the legendary objects of the far south live up to the hype and seeing the center of the Milky Way at zenith alone is worth the trip. Travel in Chile and Argentina is easier than you probably think and, certainly in Chile, astro-tourism is known and encouraged. I have assembled some links relevant to what is described above. I hope this inspires some of you to make the trip. This is a guide, written in English, by an Argentinian observer. It was an excellent guide to objects less well known than the few showpieces a northerner reads about all the time. I found it very useful in tracking down numerous beautiful, but not famous, objects. 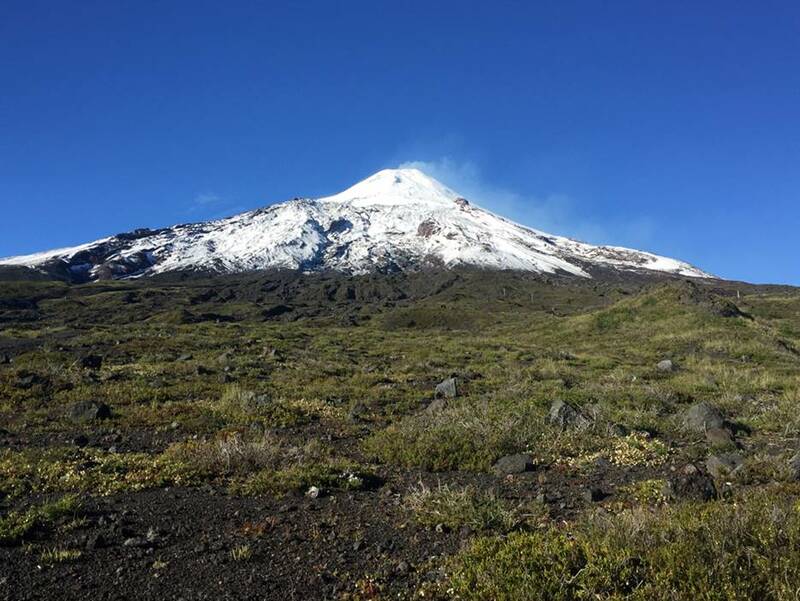 If the recent total solar eclipse in North America has awakened a desire in you to see another, note that the 2019 path of totality includes Hacienda Los Andes and the 2020 path includes the city of Pucon, at the foot of Volcan Villarica, one of the most picturesque places in all Chile. Each path extends into Argentina, as well. 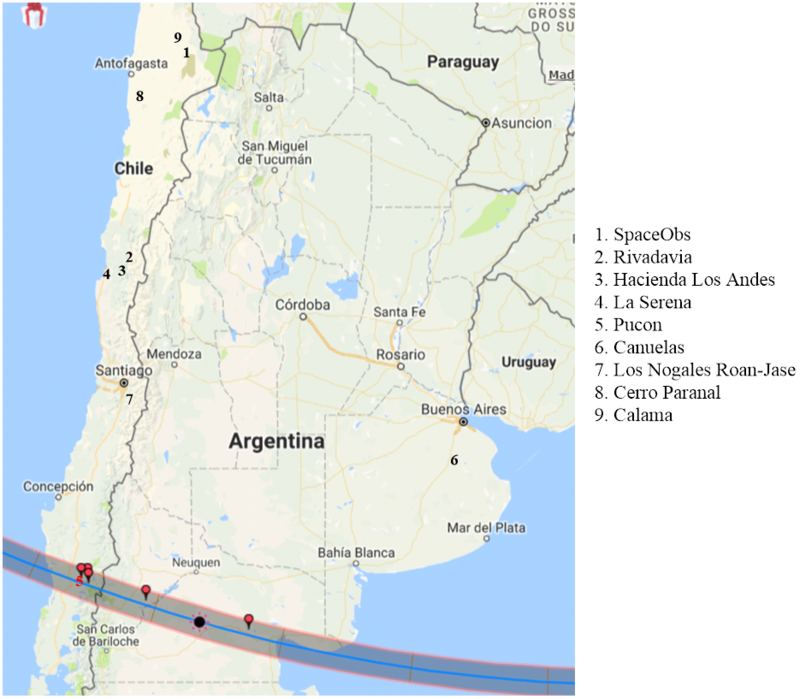 The 2019 path nearly reaches Buenos Aires and my Airbnb will get a minute or so of totality right at sunset. The 2019 eclipse will have the sun very low (around 10-15 degrees in Chile, lower in Argentina) and the centerline is well north of the Hacienda so it probably isn’t a very good spot to observe (the eclipse) from and it’s a rough time of year in terms of cloud probability. The 2020 path is well placed for both Chile and Argentina. It would be an ideal time to see another eclipse and check out dark southern skies. Volcan Villarica (that is steam coming out of it at top) viewed from the centerline of the 2020 total solar eclipse. Locations of the places described above. Such a great read, and it´s so true. Goosebumps again, when I think of the night I couldn´t sleep in San Salvador. So I walked into the courtyard of my dad´s expat-home where I stayed for 2 weeks. Gazed up over the brightly lit metropolis and saw Scorpius, high up in the south. Way higher than I ever saw it from Northern Europe. Every amateur-astronomer owes it to himself to make a trip down south. Great and extremely useful article. Thanks so much!! Wonderful story, Paul--thanks so much for sharing that! Fantastic article, "well done! ", thank you very much! Great, I mean GREAT read, Paul! Two thumbs up. Thanks everyone. I really appreciate it. I basically had to write this. An excellent article, a great read, personal yet packed with useful information. Thanks! Wow, this report is absolutely fantastic, probably the best one I've read on this website. Thanks so much for all the useful information, on a subject we've all wondered about. Amazing. Great article, writing, insights, pictures, and more. As a newbie, this is a side of Astronomy I did not know existed. You are also quite the intrepid traveler! Thanks for sharing! Thanks for taking the time to go in depth with your experiences to share with us. Particularly the travel tips - very useful. I have to see the southern skies at least once. Great article! Isn't the Hacienda the place that was operated by the late Daniel Verschatse? What will happen to it? Thanks again those who commented after my first thanks. Yes, everyone should see the southern sky (and southerners should see the north!). The South really is better. 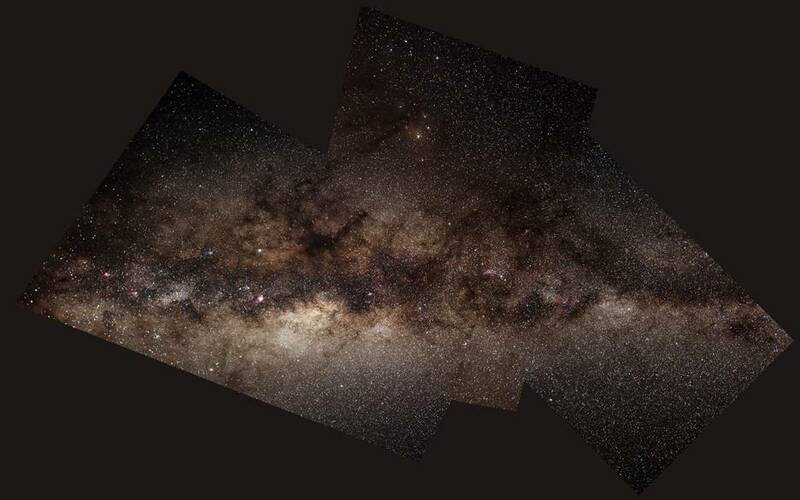 We're "north" of the Milky Way, after all. Selfishly, I wish it weren't so. Calypte: Yes, the Hacienda was Daniel's. He died just as I was leaving and I missed the email from the Santiago club. That is a big blow, I'm sure, to the Hacienda both in business terms and, more importantly, human terms. I didn't meet Daniel and was told it was because he was ill but I didn't get the impression they were that worried. Though, of course, there is no reason they would tell a simple guest something like that. Everyone at the Hacienda spoke lovingly and admiringly about him as did the folks in the Santiago club. As to how his passing affects the Hacienda, I don't know. Pure, wild speculation on my part is that his widow (who, I understand, is Chilean and lives in Santiago) will sell and it is impossible to say at this point if a new buyer would be interested in keeping it going as an astronomy focused inn. I hope so. Ideally, I'd hope folks in the Santiago club could buy it but that is even wilder speculation on my part. I suspect it is a solid business as just an inn and astronomy-only lodges are a tough go. There just aren't that many people who both want to and can get away to a place like that to rent telescopes. Like most of these places, the real money, such as it is, is probably in setting up remote scopes for online imaging. It isn't nearly as romantic but will have a much wider audience. I should add, I didn't mention the Santiago club at all in my piece. I joined the club for half a year when I arrived but wound up much busier on weekends than I'd anticipated and was away doing the things I wrote about at new moon weekends. As it happened, there was never a single Saturday that was both clear and saw me free so I never joined them for their weekly Saturday observation. The one time I visited their observatory, I found it in a beautiful spot and the members very friendly. If you're going to be there for a long while, they're definitely worth checking out and I'm really sorry I didn't get a chance to join them more. What a wonderful, and Wonder-filled, trip you've chronicled. As our Daughter-In-Law is half Chilean, her Father, Washington (named by the Chilean Government because he is a seventh Son. And 7th Son's are named by the Government in Chile.) He and I share a love of the Night Skies. I would dearly love to spend time in his native land with him, which he left as a young man to immigrate to the United States. But likely never will venture to Chile. But thank you for sharing your wonderful travels to the Southern Skies! Going to have to read again and again, I look forward to a trip like this, if even just a brief version. I hope you get a chance as well. Given your ties, it would be a fascinating trip. I can only guess at the ages involved but suspect leaving for the USA my have involved some urgency on the part of your daughter-in-law's father. Folks I know who lived and worked in Chile in the 80s say they barely recognize the place, especially Santiago. It sounds like a family trip would be fun and interesting on a lot of levels. I didn't write any about my non-astronomy travels, which were extensive, because, obviously, it isn't really germane to Cloudynights. But this was, by far, the longest I've been away from home and it didn't end up feeling like a normal trip. For one, I worked, and hard, for most of the time. For two, I never really had time to process so there are a lot of things that I forgot about almost instantly that would have been a key memory of a normal vacation. I took some stuff to the dump this weekend and had a profound flashback to getting lost in the mountains outside Pucon and happening upon a dump. But a dump that had one of the most magnificent views of any place I've ever been, just with an extensive junk yard and landfill in front of it. Anyway, I suspect that sort of thing will continue happening. Comments for Chile, March 2017: Yes! to renting a car @ airport. As noted, you are going to have to drive to dark skies! Get a 4-wheel drive, so you can go off-road. I was surprised to be able to drive at 70km/hr on the hard-packed dirt tertiary roads. Most cars are 4-speed manual, so practice on an old VW before arriving. I killed my engine twice before remembering to use the clutch, LOL...The main road is HWY 5 and is a joy to drive, except for the toll booths. Keep your receipts. I got off at the wrong exit, but was allowed to continue for free by presenting my last receipt. Love those "autobahn stops. "...Safety -- no problem, just follow common sense. Be sure to park your car INSIDE the fence of your property. In Vicuna, I was out late several nights. I parked alongside the central square and was gratified to see police patrols guarding the other 60 cars also parked there...Earthquakes, Yes! I experienced a 5.6. No damage at all -- Life on the Ring of Fire!...Bus, No! Sky and LATAM, Yes! Spend money to save time...Pelican case with travel kit: TAK FC76D objective and FS60C focuser. EPs: 24, 18, 12 and 9. Zykos tripod, alt-az mount. Will rent a 12.5 in. Portaball @ Hacienda...The reference is to NGC4945. NGC 4995 is a classic spiral galaxy seen face-on...From La Serena I could just see Rigel Kent, Hadar, Crux and False Cross. Eta Carinae was a blurr, but Canopus & Sirius shone like mighty beacons. Orion was downside up. It was impossible to see the LMC & SMC...I was the CNer staying @ Vicuna. The Vicuna light dome was manageable, but a bit annoying, since I expected darker skies. Example: I could well see Crux, but had difficulty dicerning the entire mass of the Coal Sack. When I observed from the Pengue observatory, I was finally able see that the Coal Sack has 3 main lobes...Along the hard-packed back roads, I met several couples driving campers. A (wealthy) Austrian couple shipped a VERY fancy Toyota camper to Buenos Aires and had driven as far as Hurtado. They just camped in the desert and enjoyed the pristine andean night skies. They were headed to Peru via Bolivia. They would store their Toyota in Lima and return in 2018 to continue their voyage...Australia is just too far & too expensive to reach. Using frequent flier miles on American Airlines First Class: 370K miles to Sydney, but only 220K miles to Santiago...I think light pollution is spreading all over the world and negatively affecting choice viewing spots in both northern and southern hemispheres...So, come on down to Chile before the light pollution becomes intolerable. I just got an e-mail from Elke. Hacienda continues with the same mission and equipment into 2018! My reservation is confirmed. That's great news. I hope they can keep it going longer than that. Have a great trip and tell everyone hey.